Back in March, we reviewed the Logisys Case-51, which received an 8/10, due to it’s great style and awesome air flow. This time around, we are taking a look at the Case-51W, which is essentially the same case, but with a window. Read the review to see if the various changes on this model made the case any better. 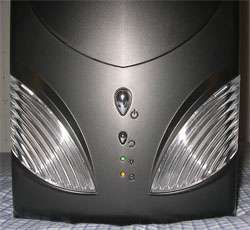 The Case-51 styling is inspired by Area-51 and Aliens, hence the large blue LED eyes. The case is a standard size, not too large for most, but neither too small. The same go for the bays, there is a sufficient amount for anybody. It comes complete with (4) 5.25″ bays for your CD-Roms and the like, and (2) 3.5″ bays for your floppy drive or something else. Internally, there is enough room for (5) 3.5″ HDD’s, with sufficient breathing room. Right below the front drive bays, are two USB 2.0 ports, as well as an Input and Output audio port. Of course, the case has a window, made of plastic. The window size is smaller than what you see on most cases. 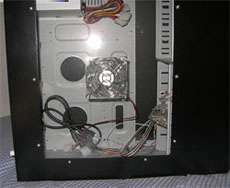 Looking straight at the case, you will be unable to see your drive bays, which is usually ok, since you won’t have anything special there to see. 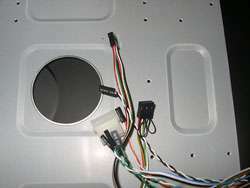 Also on the window, is an 80mm RGBY LED fan. You also don’t need to worry about a PSU in this case either, since it comes with a Power Labs 450W. 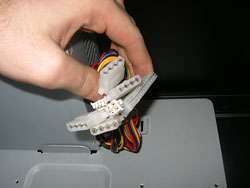 It’s a very basic PSU, consisting of (4) 4-Pin molex, (1) 3-Pin Floppy, (1) 20-Pin Mobo and (1) 4-Pin P4 connection. 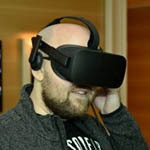 It could have been improved with more connections, including an S-ATA cable. If you have a beefy system, you no doubt want a bigger and better PSU. 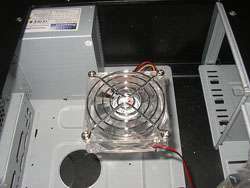 Good quality PSU’s cost more than this case alone. Finally, the case comes complete with four Thumb Screws to make opening it very easy.